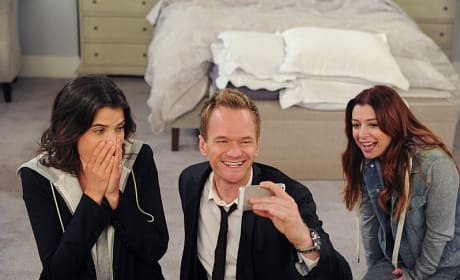 Barney needs a little help from his friends to recover from an epic hangover on How I Met Your Mother Season 9 Episode 18. Time is ticking as his friends race to get him upright in time for pre wedding photos. From the shocked expression on Robin's face we can't wait to find out exactly what's on Barney's phone. 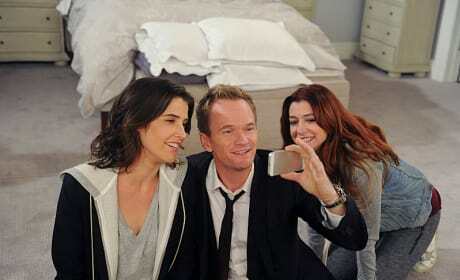 Are they watching a video or taking selfies in this scene from How I Met Your Mother? At least they're all smiling. 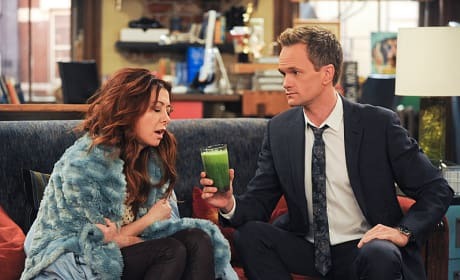 Once upon a time, on a very bad morning, Barney offered Lily his famous Hangover Fixer Elixir. 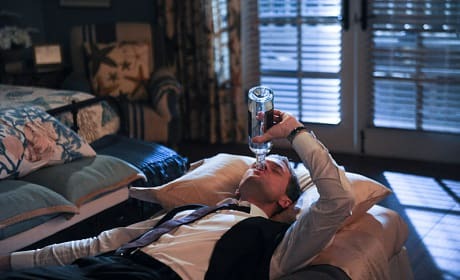 With the wedding ceremony just hours away, things look desperate when Robin can't wake Barney. "Rally" is the 18th episode of the show's ninth and final season. No, Robin's not drowning Barney but she might like to considering how hungover he is on the morning of their wedding on How I Met Your Mother. 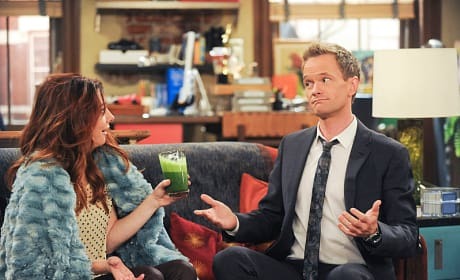 When Barney won't bounce back from his night of drinking, Ted and the gang set out to find the secret ingredient to Barney's Stinson's Hangover Fixer Elixer. They each also vow to never get drunk like their friend ever again. Ted then recounts the time when each of his friend's broke that vow. When they learn the elixir was just a placebo given to them by their good friend to cheer them up, they return the favor by telling him a legendary lie.